To win the hearts around the world, Apple has launched the dream gadget, iPhone 6 Plus(5.5”-inch) along with iPhone 6(4.7”-inch) and Apple Watch at an Event in the Flint Center in Cupertino, California, USA. If you are Indian than great news for you Apple confirmed that iPhone 6 Plus(5.5”-inch) to launch in India on 17th Oct. priced at Rs 59,999(16GB), Rs 64,999(64GB) and Rs 70,999(128GB) and iPhone 6(4.7”-inch) at Rs 54,999(16GB), Rs 59,999(64GB) and Rs 64,999(128GB). The Apple iPhone 6 Plus is already available in USA at $299 for 16GB, $399 for 64GB and $499 for 128GB with contract and iPhone 6 at $199 for 16GB, $299 for 64GB and $399 for 128GB with contract. It will take on Samsung Galaxy S5, HTC One(M8) and Sony Xperia Z3. 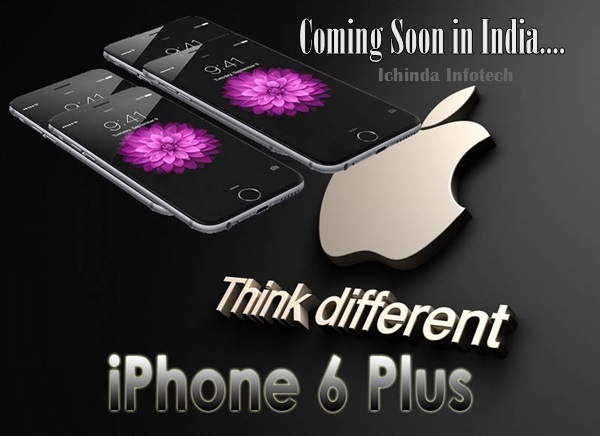 The all new Apple iPhone 6 Plus supports 4GLTE, NFC, Nano SIM, GPS offers you innovative Fingerprint identity sensor and Apple Pay features comes with a bigger 5.5”-inch Retina HD display Retina HD (diagonal) LED-backlit widescreen Multi‑Touch display with IPS technology, 1920-by-1080-pixel resolution at 401 ppi 1300:1 contrast ratio (typical) runs on most advance iOS8 with iCloud, Siri and iTune powered by a A8 chip with 64-bit architecture, M8 motion coprocessor with 16GB/64GB/128GB variant promising fastest muti-tasking experience on smartphone while for shooting it’s sporting a 8-MP iSight rear camera with 1.5µ pixels, Autofocus with Focus Pixels, ƒ/2.2 aperture with 1080p HD video recording (30 fps or 60 fps) and 1.2-MP front camera with ƒ/2.2 aperture and 720p HD video recording for video calling. iPhone 6 Plus also packed with a powerful Built-in rechargeable lithium-ion battery promising Talk time: Up to 24 hours on 3G, Standby time:Up to 16 days (384 hours), Internet use: Up to 10 hours on 3G, up to 10 hours on LTE, up to 11 hours on Wi‑Fi, Video playback: Up to 11 hours and Audio playback:Up to 50 hours. It’s weight is 6.07 ounces (172 grams) measures 6.22 inches (158.1 mm) x 3.06 inches (77.8 mm) x 0.28 inch(7.1 mm). At last few honest word, the all new Apple iPhone 6 Plus is the faster, lighter, thinner and most innovative smartphone in world market. What you think? Please be open to give your view.